Ilya Odessky’s report at the Tal Memorial website included Aronian disputing the link between draws and dull play, and also surprising the journalists in the press centre with a gnomic utterance. Odessky: It’s always different: there were Tal Memorials with a high number of decisive games, and with a lower number, and this year there have been very few decisive games. Do you put that down to chance – or to some sort of trend which we can’t yet perceive? 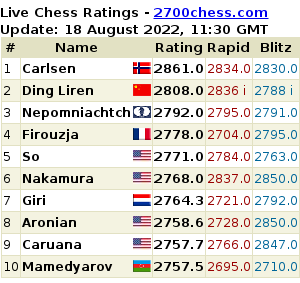 Aronian: Of course it’s a trend. A: That the tournament’s very strong. Everyone’s a fighter. O: Should readers expect a higher number of decisive games in the second half of the competition? A: But why link decisive games to interesting play? A: In that case, maybe your readers should expect interesting play. I think then their hopes will have every chance of being met. O: In other words, you think that the participants are demonstrating play of the highest class. A: The games are interesting. No-one’s trying to drain the life from positions. No-one’s out of it. Levon Aronian, dropping into the press centre, was almost always sad. He was asked: “Levon, why are you so sad, after all things seems to be going well, you’re not losing and you even won a game”. “I’m like an animal”, answered Levon. I’m already used to such statements from the leading Armenian grandmaster. Levon can say anything, anywhere and at any time. But I also had colleagues in the press centre who were amazed. Struck dumb. “You know why?” Levon continued. That’s how this man speaks. And that’s how he plays. You can’t mistake his style for anyone else’s.